Soft on nature, soft on you. Soft & absorbent. 2-ply. 198 sheets per roll; 4.5 in x 4 in. 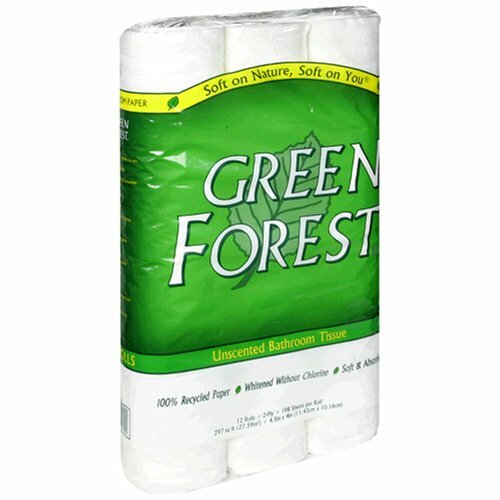 Green Forest products are soft, strong and absorbent, and are soft on the environment as well! Many environmentally friendly household paper products do a good job for the earth, but they feel stiff and scratchy. We have discovered state-of-the-art papermaking technology that not only makes paper that meets very advanced environmental standard, but the paper is also very bright and extremely soft. 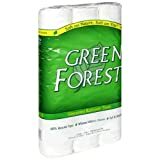 Try Green Forest paper products for yourself! We use 100% recycled paper, not trees, to make Green Forest paper products. This keeps a large amount of reusable paper from ending up in our already overflowing landfills. A minimum of 40% of the paper in Green Forest products is post-consumer recycled paper, meaning material that has been recycled from our homes and offices. Green Forest products are also whitened without chlorine bleach. The use of chlorine can release dangerous toxins which have been shown to be linked to cancers and other health problems. We believe that companies should help fund the activities of non-profit organizations that focus all of their skills and energies on environmental issues. Our company makes annual donations to such groups, and has a special partnership with River Network. River Network's mission is to help people understand, protect and restore rivers and their watersheds. Green Forest paper products are economical to buy; hypo-allergenic; safe for septic systems. Made in USA. I have a principle about using only recycled toilet paper and paper towels. This toilet paper is soft (ususual for recycled) but the rolls don't last very long so it's a mixed bag. Was pleasantly surprised at how white (very) and soft (very) this toilet paper was. It also has a flower pattern stamped into the bathroom tissue, so it does not look industrial. Will sign up for automatic delivery as soon as I figure out how long it takes for our small family to consume 96 rolls. It shipped free, so the price comes out to just 44 cents per roll. Will thnk twice next time. What can you say about toilet paper?